Across the street from the Donald Trump office established by the Philly GOP at the corner of 16th and West Oakdale streets sits an anti gun-violence display involving a silver coffin. The neighborhood surrounding North Philadelphia's Urban Crisis Response Center speaks to the reality of a city grappling with deep poverty. The scene includes a silver coffin chained to a telephone pole with a sign reading "All Lives Matter." 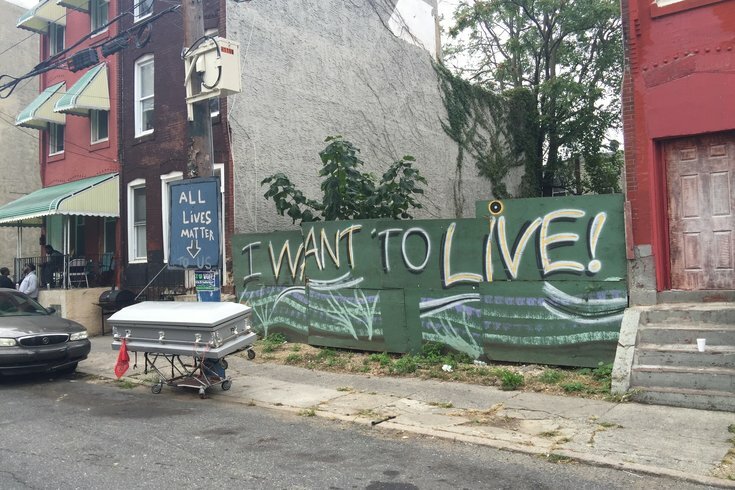 "If you mess with guns and drugs, you'll end up inside there or in a jail cell," explained a local, of the message behind that jarring prop not too far from 16th Street and Lehigh Avenue. “We need a plan 'cause we’re out here hurting,” sang Lady Lesh in that song, which doubled as a campaign spot for Republican candidate Melissa Murray Bailey, who lost to Democrat Jim Kenney. This week, that block returned to the political sphere as the city’s Republican Party announced it would become the temporary home of a Philly GOP campaign office. Suffice it to say, some neighbors told PhillyVoice that they don’t exactly embrace their presidential candidate’s way of thinking. Before we get to all that, let’s talk about how we got to that stoop on Tuesday. The Philly GOP announced Monday that it would open eight campaign offices with one goal: get as many Philadelphians to vote for Donald Trump as it can. "Our nominee is poised to win Pennsylvania and the presidency, as is evidenced by September polling that shows our nominee closing the gap in our state,” said party chairman Joe DeFelice. “We have the momentum, we have the message and we have the energy of voters on our side." The opening of the South Street campaign office already got a bit of attention. The others are located in North, Northeast, Northwest and South Philly, along with Bridesburg/Tacony, Germantown and Mt. Airy. Tuesday's vice-presidential debate offered the perfect opportunity to cruise by all of them to see whether locals in a deep-blue city were welcoming of a politically red neighbor moving in to drive votes to the Trump column. DeFelice readily conceded that, despite the announcements, they haven't all opened yet and, when they do (he hopes that happens by the end of the upcoming weekend), they won't be staffed around the clock. My tour exposed the reality that there's much work yet to be done as Election Day creeps closer. At Chelten and Pulaski avenues in Germantown, there were no signs of activity at a corner property which once housed state Rep. Rosita Youngblood’s election-day operations. Same for the Bridesburg/Tacony office. Finding the Northwest Philadelphia location was a bit tricky, too, considering there are, oddly, two 8300 blocks of Stenton Avenue. One address was a boarded-up property featuring a No Trespassing sign hidden behind overgrowth; at the other, nobody answered the office door on the second floor of a green office building that houses a notary, insurance adjuster and radio station. Trump's Northeast Philly location, at GOP party headquarters near Cottman and Frankford avenues, is not so much a campaign office as it is repurposed space. Near the corner of Frankford and Cottman avenues, a door at the Philadelphia Republican Party's headquarters is decorated with a large photo of Donald Trump. The office serves as one of eight that the city's GOP has opened, or will soon open, across the city. Sure, there’s a big smiling picture of Trump (head-to-knees) in a doorway near a trio of Trump/Pence signs, but they were outnumbered by signage for U.S. Pat Toomey and state Reps. John Taylor and Martina White. 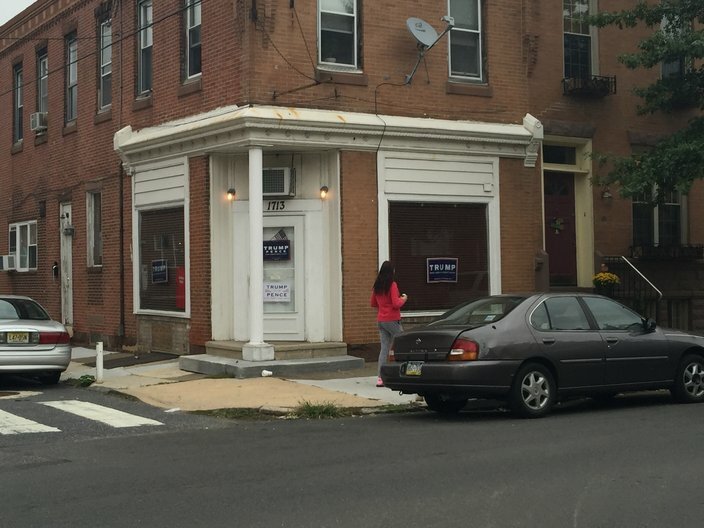 Down in South Philly, a trio of signs, Trump door hanger and Make America Great Again T-shirt hanging in the window made it clear that 1713 Wolf St., with ties to the party's 26th Ward, is politically oriented. The office felt less out of place than the roof deck across the street, where a Dallas Cowboys flag and a blue-and-silver version of Old Glory, waved. 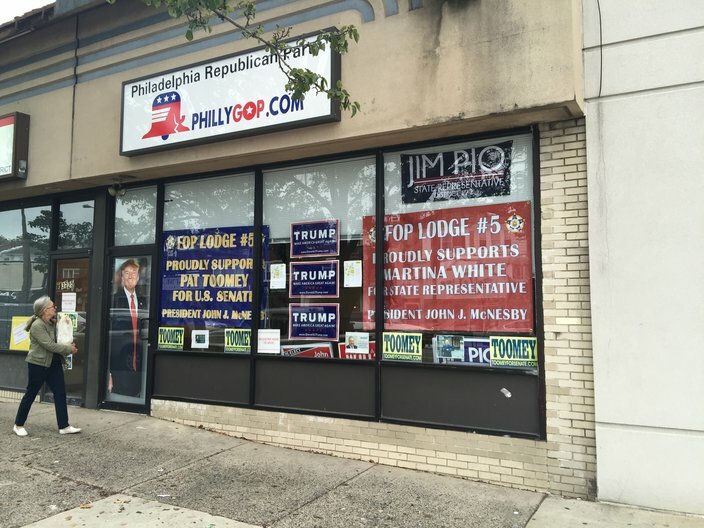 The Philly GOP's Donald Trump office in South Philadelphia. One neighbor, who chose to remain nameless, said he wasn’t surprised at all by the temporary neighbor as “there’s always something political going on there.” Sporting a Flyers T-shirt while smoking a cigarette, he didn’t seem like the type of voter that the GOP could sway. That level of apathy wasn’t apparent back at the North Philly location, though. Activist Terry Starks runs the Urban Crisis Response Center. He explained why he welcomed the GOP to a neighborhood where voter turnout will determine the size of Trump’s inevitable loss. “We’ve been fighting with the city for eight years, trying to get resources for our programs,” he explained over the phone on Tuesday afternoon. The Philly GOP "reached out to us. Actually, we reached out to them first because we’re working on getting political balance in the community." Starks isn’t a political newcomer. He was behind the video shot there last year, and appeared regularly with Bailey during the mayoral campaign. Also seeking resources were a half dozen men (ranging in age from late 20s to late 50s) hanging on a pair of 16th Street stoops across from the Trump office on Tuesday. Many of them were drinking – "Why do we drink? It helps numb the pain of this reality," explained one – and everyone spoke freely. The wide-ranging discussion covered police brutality, a "slave" mentality that exists to this day and, among many other topics, disdain for African-Americans who vouch for Trump. They viewed the campaign office as a photo-op prop in the exact type of poor community that Trump would do nothing to help if elected. "What we’ve got going on right now, it’s going to get 10 times worse if he wins," said Kevin, who didn't give his last name. "We'll have a lot of wars, and more underprivileged kids going to war, because that’s the only way to feed yourself." "I think he’s a bigot. He’s going to start a f-----g war. He said he likes wars." "The Book of Revelations. That's what I think about Trump." "He says he’s gonna get us jobs, but I don’t see it happening." "The man's saying anything he can just to get elected." "He's a bigot. There's no other way to look at Trump. He's a bigot." "He don’t have the right attitude. He will push the bomb button in a heartbeat. He'll have no problem pushing the atomic bomb. And then somebody else gonna push the bomb. Then, we’ll push the bomb. Then, somebody else will push the bomb. Trump is the wrong guy for that job." "The devil will be the devil. Conquer, divide, destroy. That’s what power is about." "This is how I size up Donald Trump: As an oppressor. He’s an oppressor." "It's the perfect race because he's a bigot who hates women, and she'd be the first president," said Rajah, who lives near the Trump campaign office. "It works hand in hand." They worried that Trump's popularity can be attributed to "white people who want to go backward instead of forward." "White people created this. They created why we are here," said a 40-something man who identified himself as "Trump's cousin" with a laugh. "Why put biggest idiot up against a female candidate? Those a-------, the Bushes, they ran this country into the f------ ground," added another stoop sitter, calling into question the trustworthiness of electronic voting machines. "Then, the Republicans in the Senate and House tried to kill everything [President Barack Obama] tried to get done. They don’t care if Hillary wins. They’re just gonna do the same thing to her. It’s all politics as usual." They remained confident that the neighborhood would remain a blue voting bloc, and chided Trump for failures in his business past. "You gotta live within your means. Check to check. That's how we live," said Vic. "How's this m----------- gonna file for bankruptcy all those times and ask us if we're tired of living in poverty?" They also talked about the "Willie Lynch syndrome" in the context of explaining life in this sliver of North Philadelphia, and mocked Trump surrogate Don King as someone who "robbed his own kind. Don King ain't s--- anyway." "Trump got into this thinking, 'Let’s see how big of an a------ I can be. At the very least, I'll get publicity out of it. It's gonna generate money anyway," said Rajah. "Then he thought, 'Damn, I can actually do this f----- s--- now' when he saw how it went. "But, if he can degrade his own child on TV, what do you think he thinks about you? He already said black people, you live in ghettos, so what you think he’s going to go and do for you? Us black people ain't gonna have anything if he gets elected." They were also angry about reports that Trump eluded paying federal tax, and called himself "brilliant" for doing so. "He's a billionaire, and says he's not going to pay taxes but you m-----f------ have to? That money should have gone back into the country. People needed that money," Rajah continued. "He'll cut his taxes and you can bet he’ll raise yours. I need that same loophole. "Trickle-down? The money should start down here and go up. We always spending money down here. We always gotta go to the store down here. Money goes up. It don’t come down." "I ain’t gonna Trump you. Everything’s gonna be alright. You’re gonna get all your money."